There’s a multitude of fish showing up on the Fort Lauderdale reefs. First off, on our drift fishing trips, we’re catching a lot of mangrove and yellowtail snappers. 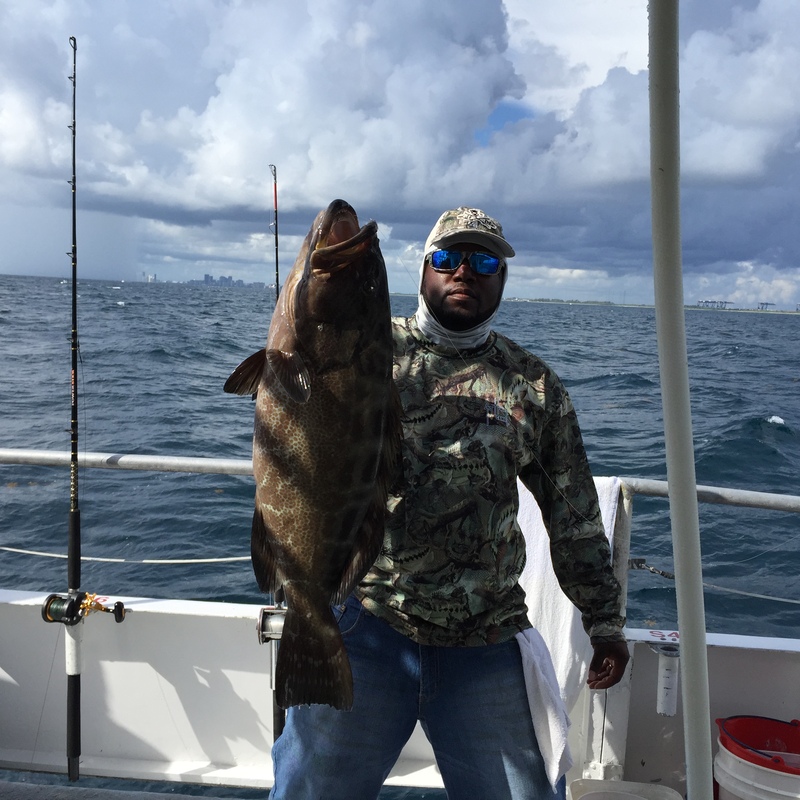 An occasional big grouper might be caught on one of our drift trips too. 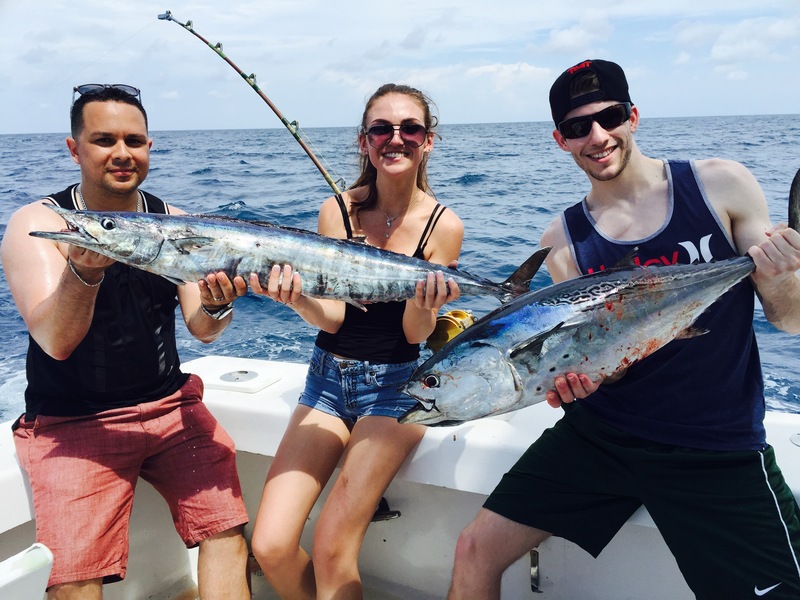 Mainly, we’re bottom fishing on that trip, but if an angler prefers a top-water rig, you have the possibility of kingfish, bonitos, blackfin tunas and mahi-mahi. All are possible catches this month fishing the water over the 100-120′ reef. 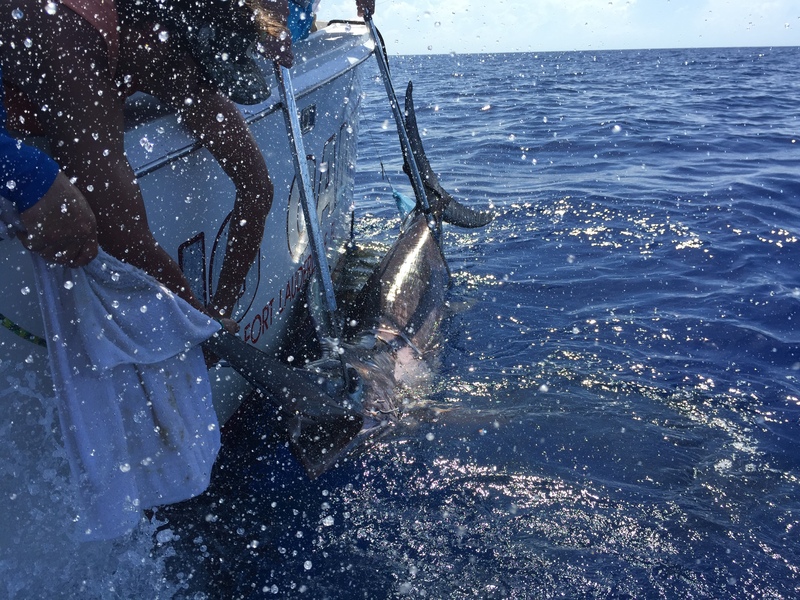 On our sportfishing charters, the stakes go up. Trolling allows us to cover 10X the territory that we can cover drifting in the same time period. We can troll deep lines and surface lines simultaneously, cover all the different water columns on the reef. Trolling the reefs this month yields bonitos and kingfish, sometimes more bonitos than you even care to catch! Also you have the chance at an oddball blackfin tuna, barracuda or wahoo! Even a sailfish or two gets caught on the troll this season. 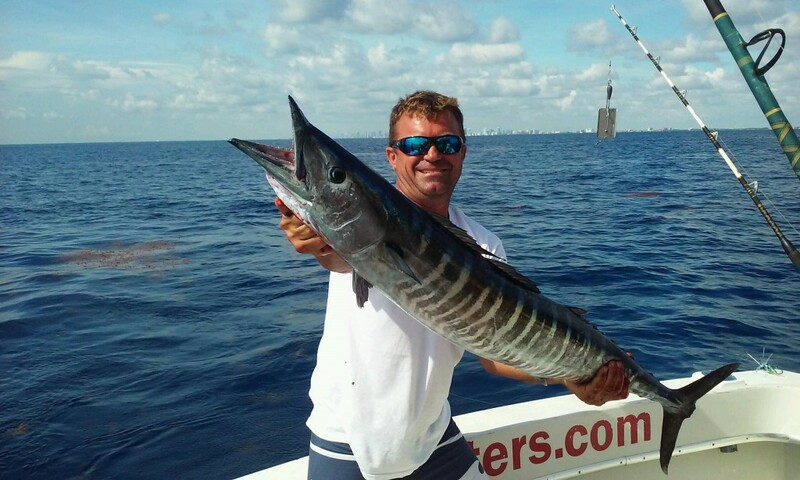 Nice wahoo caught on a sportfishing charter with Fishing Headquarters. Mahi-mahi mainly stay further offshore this time of year. Once in a while they may come in on the reefs, but they mainly stay 5-10 miles offshore. There’s too many predators on the reefs this month. Going out for mahi-mahi is a gamble. We get them sometimes, but not all the time. And it requires a big investment in time, usually a 6 hour is the least we go that far offshore on as it leaves nothing to fall back on if we don’t find them out there. But that’s fishing… And it makes it all the more exciting when we do find a school of them and we can crush ’em, fill the whole fish box in minutes. The dolphin are out there to be found, you just have to go looking and cover A LOT of ground. Mostly schoolies this time of year but they’re grouped together in schools so you can catch a good amount of them. Sometimes a big one will be out there, a loner maybe with a cow or two with him. Dolphin fishing can be hours and hours of boredom, interrupted by a few moments of chaos and panic. Nice wahoo and bonito caught trolling the reef. Wrecks deserve an honorable mention too as they are holding some big fish this month. Amberjacks are still biting on the deep wrecks. It’s a worthwhile endeavor to save 1/2 hour at the end of the trip to cherry pick a couple shipwrecks to make a quick drop on with a live bait… to see if anyone is home. 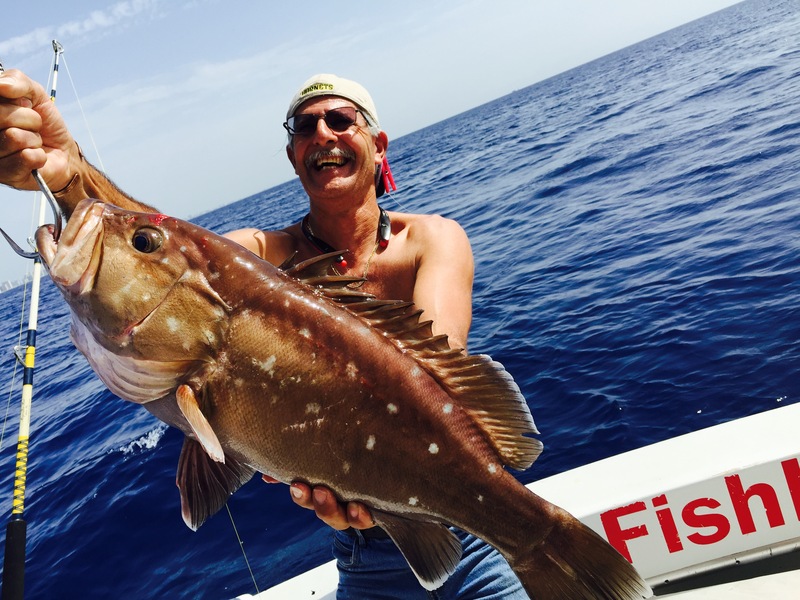 Once in a while, a huge warsaw grouper might be caught. These monsters of the deep aren’t caught often, but I sure get excited when one of them pops up to the surface. Coming up from so deep, the gases expand inside their belly cavity and it blows the stomach up with air. That’s what’s poking out of the warsaw’s mouth in the picture below. These monsters of the deep are fun to catch as they fight extremely hard (until they get near the surface). Huge warsaw on the deck with Capt. Rod lying beside him. That’s his belly sticking out of his mouth. There’s a lot biting off the Fort Lauderdale coast this month, especially on the reef. While some days are slow days and some days are great days, the majority of fishing trips this month should be action packed with some great fish stories. Good luck everyone. I’ll sea ya on the water. 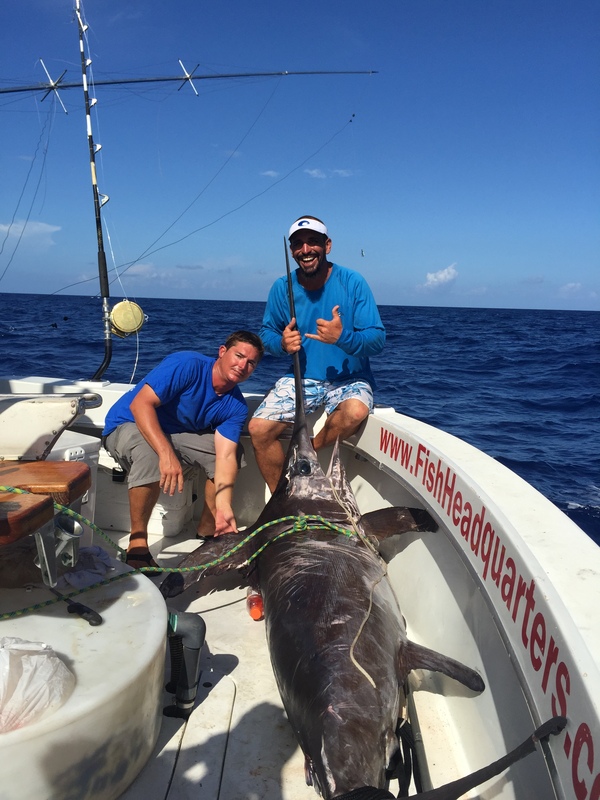 Monster swordfish caught on a daytime swordfishing charter in Fort Lauderdale with Fishing Headquarters. 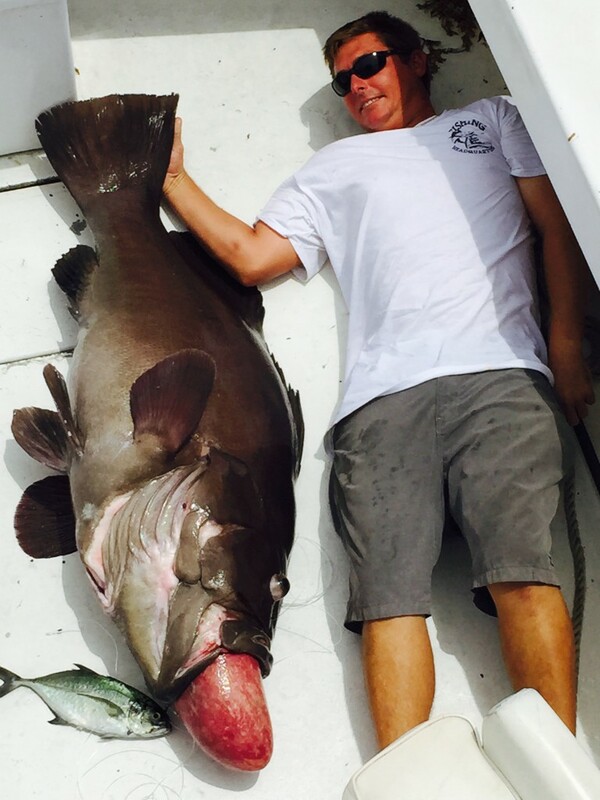 There are some monster fish biting off the Fort Lauderdale coast this week. Sailfish and sharks have been active, lots of action on the reef and there are some pretty large fish biting around the shipwrecks. That’s not all though. Today we had a daytime swordfishing charter and ended up catching an estimated 500 pound swordfish, one of the biggest we’ve ever caught off our dock. It was an incredibly exciting and equally exhausting catch. Fishing trips like this don’t happen every day. 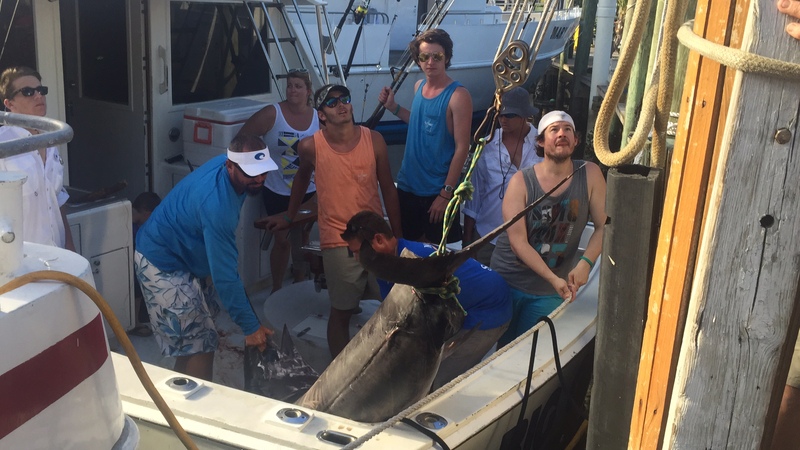 Hauling the monster swordfish into the boat. We had a swordfishing trip today, a daytime trip, which meant fishing with electric reels down on the bottom out in 1500 ft of water. Up until a few years ago, we would only go swordfishing at night. Swordfish are nocturnal feeders. During the day, they stay down on the bottom at average depths of 1500ft deep. At night, swordfish rise to within a few hundred feet of the surface to actively feed and look for food. It only made sense to us to only go out to fish for them at night. We never fished for them during the day because we didn’t think they would bite. In the past few years, we’ve found out how wrong we were. Swordfish feed during the daytime too, they just stay down deep in the cooler waters during the daylight hours. Capt. Rod and Mick with their monster catch! On our daytime swordfishing charters, we usually troll out to the fishing grounds which are about 20 miles offshore. This is through prime mahi-mahi territory. Mahi-mahi are actually more of a high-percentage catch for us on swordfishing charters than swordfish are. On the troll offshore, you can hit mahi-mahi, blackfin tuna, barracuda, wahoo and even the rare and elusive blue marlin. Today though, we didn’t get a single bite on the way out to swordfishing grounds. We made 4 drops before we finally hooked the fish. Each drop is pretty time consuming. At those depths, it takes 10-15 minutes just to drop your bait all the way to the bottom. With the Gulfstream current, its hard to keep the bait on the bottom without letting it drift up higher. The scope of the line and the current are constantly pulling it. Anyway, on a single swordfish drop, you get about 15-20 minutes of bottom time with the bait in the zone. After that, it has drifted up too high so we reel it in and start again. It takes 15-20 minutes for the electric reel to wind in all that line, without a fish on it. 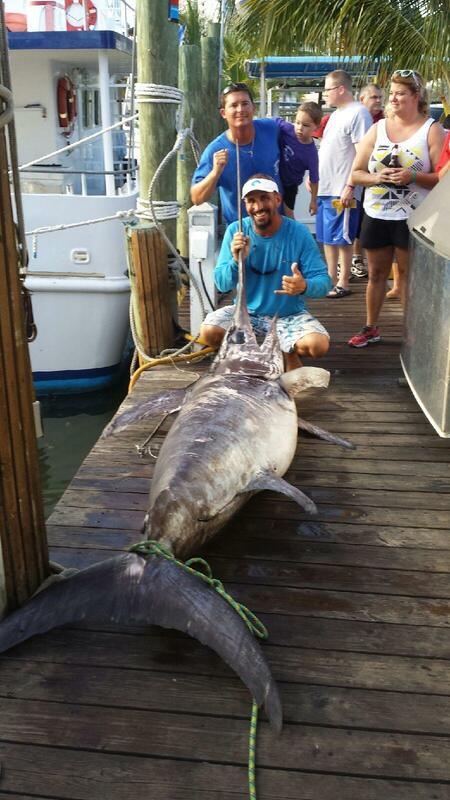 Big swordfish on the dock after a daytime swordfishing charter. On the 4th drop, we finally got a hookup and it was BIG. The fish smoked drag off the reef for the longest time. We must have had almost a mile of line off the reel. We slowly gained it back in, inch by inch. After two hours, we finally got sight of the fish and could see how big it was. The last hundred feet of line took the longest and the fish appeared bigger and bigger and we brought him up closer to the surface. When we had the fish about 20 feet away, Mick, the first mate on the trip, threw the harpoon which impaled the fish through it’s shoulder. The fish was caught! Hauling the fish into the boat was more than a small task. It took everyone aboard to get this fish into the boat. High fives all around! There was no beating the catch we just got so we throttled up and ran the 20 miles back to Fort Lauderdale to take pictures with the fish. We used a block and tackle to lift the fish onto the dock. We took pictures with the fish over the course of the next hour and half. After the photos were done, we cut the fish up and gave the meat away to friends and customers, feeding over a hundred different people. Catches of swordfish this size don’t happen often. 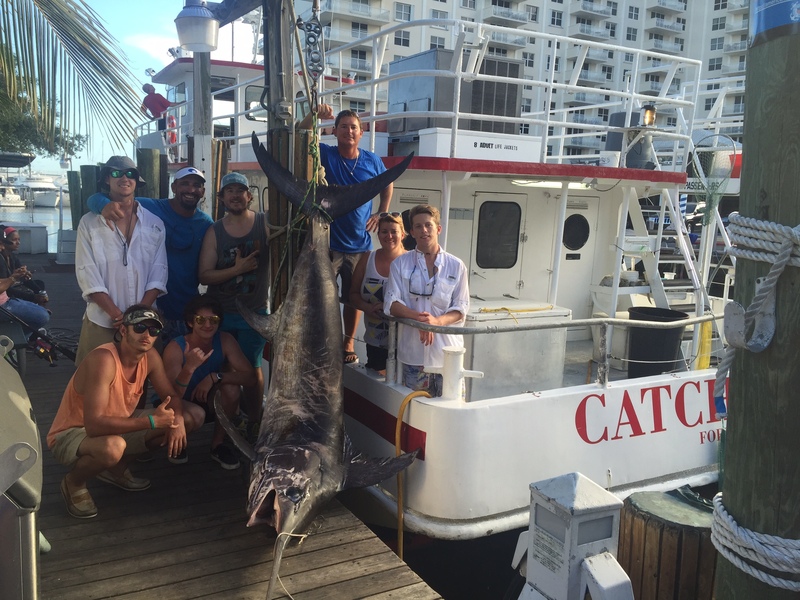 The big fish are biting off the coast of Fort Lauderdale. Swordfish, sharks, sailfish, marlin, barracuda and amberjacks are all big game fish that are in season now and lurking off our coast. Let’s go fishing.